So… 300 feared dead. All of this by ten people. How can so small a number cause so much death? Simple; Nobody could defend themselves. Imagine, dear reader, what would have happened, had these terrorists run into an armed populace, as opposed to an entire city of sheep. 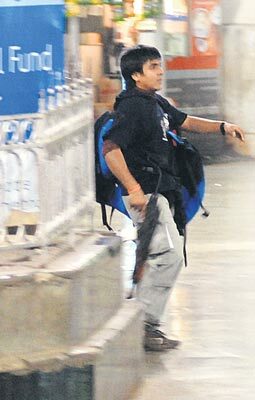 The guy who took this photo… one Sebastian D’Souza, asked the police on scene to shoot this guy. Nobody did. The police, it seems were the only ones armed, and the only ones capable of responding. They did nothing, for reasons we can only guess at. There does seem some question if the police weren’t in on this attack. However that may be, I’m willing to bet there’s a lot of other families that wish someone had a gun to respond to the threat. The lesson here, in all it’s bloody detail is that we cannot depend on government to defend us. BUt after all the attacks we’ve seen over the last 10 years, around the world all of them to the same effect… Islamo-fascists aside, we still have Virginia Tech, Columbine HS, and a few others. In each case, the victims were chosen because they are unarmed… by government fiat. Sitting ducks. But since nobody listened back then, I don’t suppose they’re going to listen now. No matter how many people die. After all, having guns would encourage violence, right?